Our company started as reinforcement constructor but now we grow up to a development company that is making new businesses like energy business around the world especially in Asia, real estate business, product manufacturer, which is for adapting trend of the times and answer our customer’s needs. We are innovating on new worth and providing our excellent service considering our customer first with our principle“Always improving, always challenging”. That is why all our company’s staff are always demanded to think and move seriously. Those who can keep cultivating one’s ability is the only one who can fulfill their own lives. That is why all our company’s staff are always demanded to think and move seriously. Those who can keep cultivating one’s ability is the only one who can fulfill their own lives. The talent we need is one who is thinking to start a business in the future, who has lived in foreign company as studying abroad and traveling as a backpacker etc or who is independent having responsibility for themselves. The most important is to have a will to change the world with their capability. The age is not a big problem in our company. Some staff became a director after working just 2 years. We are preparing a treatment that our staff can feel satisfaction. We are looking for a new crew fighting together!! “Speed” is the strongest element.Making a group of Exectives. Our company has been doing reinforcement business that plays a part of a "framework" which is extremely important in the building industry for many years as our main business. However, everyone also experienced a remarkable Lehman shock, sales did not grow. I was at a loss what to do with corporate management in the future. However, we noticed one thing. Other companies in the same industry continued to "leave" without jobs and without sales. Our sales result was also not good but doing business with a major construction company, the "trading volume" of the reinforcement was no different from the normal year. All in all,this was the result that we all have a feeling that we wanted to respond to requests from customers very much and we were constantly improving and constantly challenging. We were serious with the strong feeling of offering "Excellent service" to customers. At work, we face the customer directly from the front, we have a "useful spirit" and always respond to a step ahead of the customer's request with a sense of speed that no other company can come with. I think that it will lead to "excellent service". I always say to employees, "It is always a person with sense of speed who can win a game." The "photovoltaic power generation project" started in September 2009 has been developed based on these facts, and it is all right. Today, we have a business alliance with Chinese largest solar power generation panel maker, "Trina solar" and we have launched a new brand of photovoltaic panels. We are continuing a new challenge. My goal isto produce many executives from Eguchi Holdings and create a group of executives./strong> From now on, we will make Eguchi Holdings a wholly holding company in several years. Currently, we are developing real estate business, coffee business, import/ export business, restaurant business besides reinforcement construction and photovoltaic power generation business. We are recruiting those who will be responsible for presidents of subsidiaries, by making everything that seems to be a business. Those who want to success in a shortest way, compete for their lives fairly, enjoy life as a manager in a few years. I would like to continue challenging with these people. Why don’t you join higher-grade business with us? In this company, all employees are motivated to constantly improve and challenge. Even employees who just joined the company will be able to challenge anything if they have enthusiasm and seriousness. In fact, I have received the position "Exective director of sales" in 2 years since I joined the company and now I am also in charge of large projects exceeding 500 million yen. Growth is what you grab on your own. It is also up to you to dive into the place of training for self-development. There are things that bother me hitting the wall, but my boss and seniors will follow up, so I can always look forward. If you have a proposal, you can make a suggestion directly to our representative director. It is an environment where we can create new businesses by themselves, so we are excited and enjoying working here. From the company representative who was originally acquainted to joining the company, he was invited to join us as saying, "I will start selling the solar project with the company and leave it to me.The impetus of entering in this company is a word from the Representative Director who we are originally acquainted to as saying “I am going to start solar PV business staking the future of our company on.” Even when our business switched from residential solar system to industrial system, I did a lot of hardships that I did not understand but increasing the number of colleagues and being helped by many people, I increased what I could do. We will challenge even larger projects without losing our commitment to continue to challenge. In the future, I hope to refine my technical capabilities and continue to challenge not only in Japan but also in foreign countries. My personal goal is to make solar engineering department independent and to be a representative director. 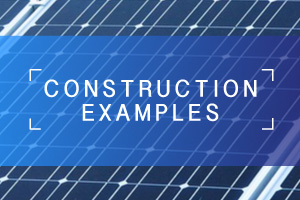 Furthermore, we are planning to start a new business and expand our business without concern for solar power construction. A trigger to join this company is that EGUCHI STEEL’s chief at that time (now representative vice president) invited me saying “Let’s work together”. My colleagues and bosses respect my way of thinking, so I can work in a fulfilling environment. Also my bosses are friendly, so feel free to consult not only about work but also private thing. Since the business content is also substantial, utilizing my experience so far, I will hone my skills challenging new jobs and grab the opportunity to the next step. Distribute things not in Japan and things not in the world. Please listen to our Representative Director and the voice of the staff. Baseball players who are active in major leagues thought "I want to play baseball in major leagues in the future", and because of practicing for that, the stage of the major should have been given.We are preparing a stage for the people who want to make up for the shortest, compete for own life fairly and create a new job as a business developer. Business genre of EGUCHI HOLDINGS is depending on the people; from a person's point of view it is a real estate business, sunlight energy development from one person's perspective, coffee business from a certain person, civil engineering and accounting / finance professionals. 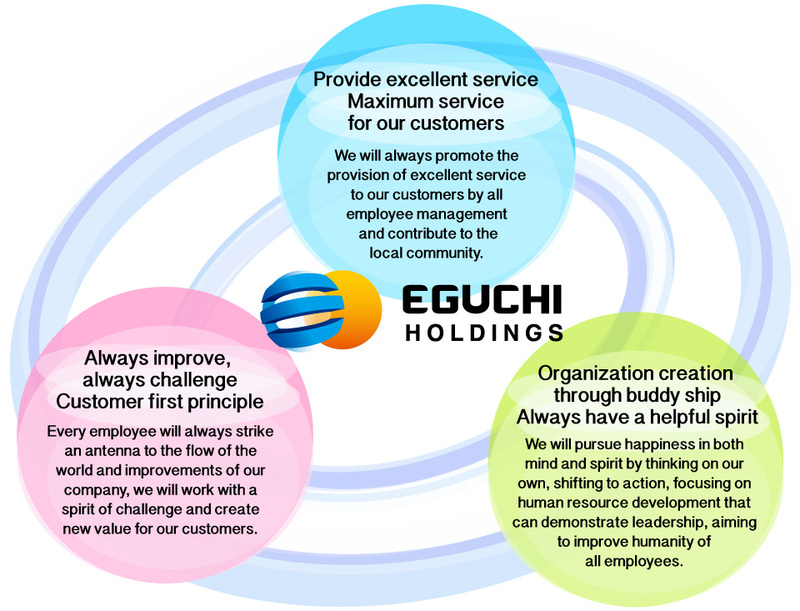 Eguchi Holdings is steadily accumulating business know-how with diversified management. Founded in 1968 and launched its business from reinforced concrete work, it has evolved into a development company that is now creating new businesses. "Always Improvement, Always Challenge" to create new value by tackling the challenging spirit, considering customers first, providing "excellent service" and "making organization by buddy ship based on useful spirit". With these philosophy in mind, each person thinks seriously. Let's passionately change the world with our own hands, I want to work with those who have such passionate feelings. Currently, in the project we are working on, one of the young employees in the second year of joining the company is in charge of the directors. The employee is making a point of departure so that he can climb up to the manager of the planning office. However, this is not an unrealistic super special. As a business developer, regardless of age to create the next business, Eguchi Holdings has a distinctive human resource development program, which makes it possible to nurture an entrepreneurial spirit altogether. Each member working together will set a goal for "I want to be" and will also hold camps and the like to move forward toward that.I do not want to finish my life like this! My power is not like this! I would like to try my own power in the business world! I would like to meet such a person with as many people as possible. In order to be what you want to be, you only have to start moving!